You don’t actually need the Cortana/Search box to search; if you press the Windows key and start typing, you’ll get the same search experience. If you want to perform a voice search — normally accessed by clicking the microphone icon in the search box, just press “WIN + C”. Since the search box takes a lot of space, you can configure Cortana as an icon instead. 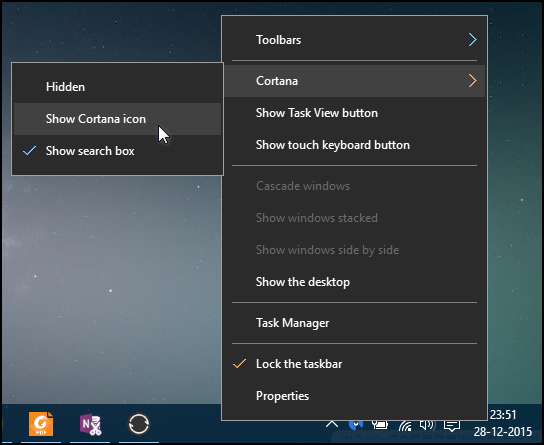 Right-click the taskbar and choose “Cortana > Show Cortana icon” from the pop-up menu. Even as an icon, Cortana is superfluous. You can still use Cortana with the Windows key or “WIN + C” for voice search. 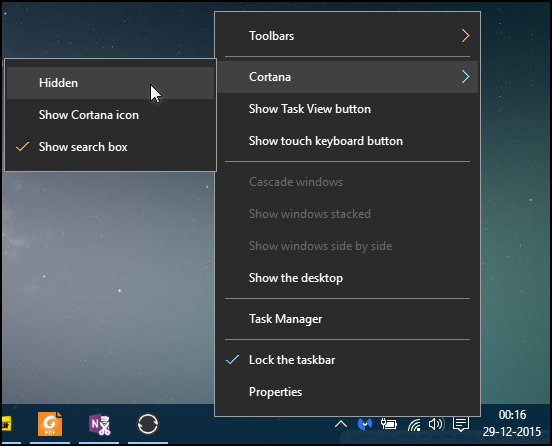 To get rid of the icon, right-click the taskbar and choose “Cortana > Hidden” from the pop-up menu.